It can be quite confusing, so we’ve written this awesome guide on opening a bank account in New Zealand! Scroll down below to get started. Why Open a Bank Account in New Zealand? Reasons behind the choice of opening a bank account in New Zealand can greatly vary from person to person. Maybe you’re an overseas investor looking to purchase real estate. A student wishing to take a gap year and go on a working holiday around New Zealand. Maybe you’re moving to New Zealand to start a new life and are in the process of choosing a bank. You could even be a current resident or citizen looking to open your first account. Whatever the case may be, we’re going to show you the process on how to open a bank account in New Zealand. There are many benefits to simply having a bank account as well. The ability to pay bills online comes to mind as one of the greatest! Could you imagine having to visit the water corporation or your internet provider every month to settle the bill…No thanks! Not only that, but over 66 percent of transactions in New Zealand are now completed electronically. That’s nearly double the world average of 32%. So it’s definitely beneficial to be able to join the locals and start paying with your bank account through your card. If you have a legitimate employer, they will most likely require you to open a bank account as well in order to receive your wages. Wouldn’t want to miss out of that now! Of course, you’ll also want to know what currency New Zealand uses. It’s the New Zealand Dollar (NZD). Fun Fact: The NZD was the 11th most traded currency in the foreign exchange market in April 2016. Also, their lowest coin value is 10c, meaning everything gets rounded up or down to the nearest 10c if you’re paying with cash. Alright, we now know why you want to open a bank account, but what do you need to actually open one? What kind of identification do the banks require? Can a foreign/traveller open a bank account? What happens if you don’t have a permanent place of residence yet? Photo ID. Passport works best if you’re coming from overseas, whereas we’ve had reports an international drivers license won’t work. If you already live in New Zealand, your driver’s license or evidence of age document will most likely be first on your list. If you’re a minor, they may ask you for a parent or guardian’s identification as well. This isn’t an essential requirement, to begin with, but it’s in your best interest to apply it to your account as soon as possible. Without an IRD attached to your account, all interest earned will be taxed at the highest rate of 33%. Apply for and IRD here if you’re a resident. If you’re a non-resident/offshore individual, find the application form here. More recently, banks have started to place a higher importance on verifying an applicants identity through their place of residence. If you’re already living in New Zealand, this should be no problem at all. If you’re moving to New Zealand and already know your future address, use this in the application process. It may become a bit more complicated if you’re moving around New Zealand without a permanent place of residence waiting for you. You can either get in contact with your hostel/hotel and ask if they can help you out, or you can pay for the service. 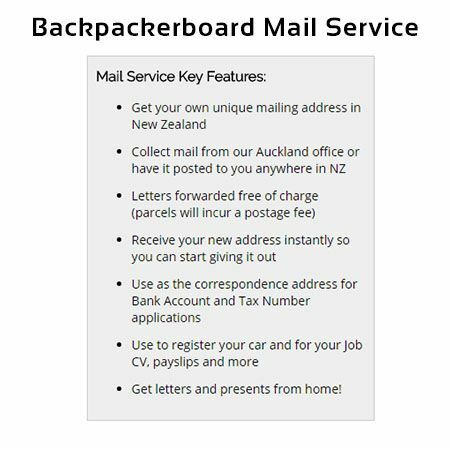 Backpackerboard offer a mailing address for $44.99 for 6 months, whilst PrivateBox offer a similar service for $60 for 6 months. Some banks used to require a minimum deposit before your account would be activated. These days the market is far more competitive and the minimum balance requirement is all but gone (except for a few banks). If you do land on a bank that has a minimum requirement, give them a call beforehand to see if they’ll waive it for you. Never hurts to ask! We’ll take you through the process of opening a bank account with a few of New Zealand’s biggest banks. These are ANZ Bank, ASB Bank, Bank of New Zealand, Kiwibank, and Westpac. Click here if you’d like to see all the banks in New Zealand. Phone: Alternatively, you can call them on 0800 269 296 if you’re in New Zealand already, or +64 4 470 3142 if you’re currently overseas. In person: Simply head in to one of their branches and speak with a teller. ANZ have a reference guide for acceptable forms of identification and address verification. For all new bank accounts, ANZ do require both to be verified before the account can be opened. Click here to see the exact requirements. If you apply online, and all your identification is suitable, the account many be opened within a day. For phone it may take a bit longer as the documents need to be verified. Online: Living in New Zealand – Click here to start their introduction package process. Not living in New Zealand – The process will take a bit longer as you have to fill out this form and then send it to their address in Auckland or email it to internationalbanking@asb.co.nz with the required documentation. Phone: If you’re calling from New Zealand, call 0800 803 804. If you’re overseas, call +64 9 448 4340. Note that international charges may apply. In person: Find an ASB branch close to you if you prefer to open the account in person. If you’re already living in New Zealand, all ASB require’s is an acceptable form of photo ID (passport or NZ driver’s license). • Please note: Certifications must be in English, and can only be obtained from a Solicitor, Notary Public, Justice of the Peace, Embassy, Consulate or High Commission of the country of issue. All Certifications must record the full name, occupation, telephone number and address of the person certifying the documents and include an official stamp. Be Prepared to supply a minimum account opening deposit of at least NZD 500 by International Money Transfer within one month of notification that the account has been opened and provision of the new account number. At this point, further funds can be sent electronically. Failure to credit your ASB Account by at least NZD 500 will result in your account being closed after six months. Foreign or travelling applicants opening an account can expect to wait for three (3) working days to open your ASB New Zealand Dollar Account. New Zealander’s can expect their account to be open in a shorter period of time provided all the documentation is correct. Online: If you’re already living in New Zealand, you can fill out the application here. From there, BNZ will require you to physically come into a BNZ branch to be sure of who you are and where you live. If you’re not living in New Zealand, visit the online application on this page. Phone: From New Zealand, call 0800 275 269. If you’re not living in New Zealand, and require an account faster than the online application (which takes 3-5 business days), call +64 9 976 61319. Again, be aware of any international charges that may apply. In person: It’s best to fill out the online application, or give them a call before visiting a branch. If you’re intent of visiting a branch, you can find all their locations here. Opening an account from overseas, requires you to be at least 16 years of age, and have not yet arrived in New Zealand, or have been a resident for less than 6 weeks. From there, when you visit a branch to activate your account, they require identification and address verification documents to be provided. If you’re opening an account from New Zealand, we advise to complete the online application, and wait for the email to tell you what to bring to your meeting. Online applications from overseas can take 3-5 business days to process. You must be in the country to activate your account in order to start withdrawing money. Applications from within New Zealand can vary in time, depending on when your appointment is made with your chosen branch. Online: If you’re living in New Zealand, you can open an account online on this page. Overseas applicants should fill out this form, and then email a scanned copy to service@kiwibank.co.nz. Phone: Kiwibank prefers applications to be made online but you can call 0800 11 33 55 if you’re in New Zealand, or +64 4 473 11 33 from overseas. In person: You can find locations of all the Kiwibank branches here. New Zealand applicants are required to be at least 13 years of age. Parents opening a child’s account should do so in-person at one of their branches. Passport or driver’s license, and proof of address must be provided and verified before any withdrawals can be made from the account. Overseas applicants require the same documents as above, but they must also be certified by either a Commonwealth Representative, Lawyer, Notary Public, Honorary Consul, or a Member of Parliament before they are sent to Kiwibank. Online applications from New Zealand will have their account activated immediately. However, until verification of identity and address has been processed, no withdrawals may be made from the account. It’s taking us a little longer than usual to process new applications. Please bear with us, while we get up to speed again. We’ll be in touch soon. Online: Living in New Zealand and want to open a Debit MasterCard account? Apply online here. There are certain other accounts in which you can simply fill out an online application as well, see here for the list. For all other accounts, they require you to make an appointment and visit a branch. If you’re not living in New Zealand, you can fill out this online application form to setup a new bank account. Phone: Call 0800 808 007 if you require any help and you’re in New Zealand, or +64 9 348 9311 if you from overseas. Toll-free options for the UK are 0808 234 1208 and South Africa 0800 983 942. In person: You can alternatively visit any number of their many branches around New Zealand. Applications from New Zealand require the standard forms of identification which can be found here. If you’re under 16 years of age, you must have a parent/guardian/other family member’s passport or driver’s license as well. Overseas applications require the same forms of identification as above. Note these must be presented in person at one of their branches in order to activate your account and proceed with withdrawing money. Time varies depending on when you make the application, how soon you visit your nearest branch with identification, and how busy the branch may be at the time. It’s best to contact Westpac directly to be sure of times if you need an account rapidly. Now you know how easy the process of opening a bank account in New Zealand really is! What are you waiting for?! Get going and open your first bank account in New Zealand! If you have any further question, or would like to see another specific topic covered on this website, please contact us today!